The contents of the REACH Rehab + Chiropractic Performance Center website, such as text, graphics, images, information obtained from REACH Rehab + Chiropractic Performance Center’s licensors, and other material contained on the REACH Rehab + Chiropractic Performance Center Site (“Content”) are for informational purposes only. The Content is not intended to be a substitute for professional medical advice, diagnosis, or treatment. Always seek the advice of REACH Rehab + Chiropractic Performance Center, your physician or other qualified health provider with any questions you may have regarding a medical condition, treatment, stretches or exercises. Never disregard professional medical advice or delay in seeking it because of something you have read on the REACH Rehab + Chiropractic Performance Center Site. If you think you may have a medical emergency, call your doctor or 911 immediately. REACH Rehab + Chiropractic Performance Center does not recommend or endorse any specific tests, products, procedures, stretches, exercise, opinions, or other information that may be mentioned on the Site. Reliance on any information provided by REACH Rehab + Chiropractic Performance Center, REACH Rehab + Chiropractic Performance Center employees, others appearing on the Site at the invitation of REACH Rehab + Chiropractic Performance Center, or other visitors to the Site is solely at your own risk. REACH Rehab + Chiropractic Performance Center authorizes you to view or download a single copy of the material on the REACH Rehab + Chiropractic Performance Center Site solely for your personal, noncommercial use if you include the following copyright notice: “Copyright © REACH Rehab + Chiropractic Performance Center. All rights reserved” and other copyright and proprietary rights notices that are contained in the Content. Any special rules for the use of certain software and other items accessible on the REACH Rehab + Chiropractic Performance Center Site may be included elsewhere within the Site and are incorporated into these Terms and Conditions by reference. The Content is protected by copyright under both United States, Canadian, and foreign laws. Title to the Content remains with REACH Rehab + Chiropractic Performance Center or its licensors. Any use of the Content not expressly permitted by these Terms and Conditions is a breach of these Terms and Conditions and may violate copyright, trademark, and other laws. Content and features are subject to change or termination without notice in the editorial discretion of REACH Rehab + Chiropractic Performance Center. All rights not expressly granted herein are reserved to REACH Rehab + Chiropractic Performance Center and its licensors. The use of the REACH Rehab + Chiropractic Performance Center Site and the Content is at your own risk. When using the REACH Rehab + Chiropractic Performance Center Site, information will be transmitted over a medium that may be beyond the control and jurisdiction of REACH Rehab + Chiropractic Performance Center and its suppliers. Accordingly, REACH Rehab + Chiropractic Performance Center assumes no liability for or relating to the delay, failure, interruption, or corruption of any data or other information transmitted in connection with use of the REACH Rehab + Chiropractic Performance Center Site. The REACH Rehab + Chiropractic Performance Center Site and the content are provided on an “as is” basis. REACH Rehab + Chiropractic Performance Center, ITS LICENSORS, AND ITS SUPPLIERS, TO THE FULLEST EXTENT PERMITTED BY LAW, DISCLAIM ALL WARRANTIES, EITHER EXPRESS OR IMPLIED, STATUTORY OR OTHERWISE, INCLUDING BUT NOT LIMITED TO THE IMPLIED WARRANTIES OF MERCHANTABILITY, NON-INFRINGEMENT OF THIRD PARTIES’ RIGHTS, AND FITNESS FOR PARTICULAR PURPOSE. The accuracy, reliability, completeness, currentness, or timeliness of the Content, software, text, graphics, links, or communications provided on or through the use of the REACH Rehab + Chiropractic Performance Center Site or REACH Rehab + Chiropractic Performance Center. The satisfaction of any government regulations requiring disclosure of information on prescription drug products or the approval or compliance of any software tools with regard to the Content contained on the REACH Rehab + Chiropractic Performance Center Site. In no event shall REACH Rehab + Chiropractic Performance Center, its licensors, its suppliers, or any third parties mentioned on the REACH Rehab + Chiropractic Performance Center Site be liable for any damages (including, without limitation, incidental and consequential damages, personal injury/wrongful death, lost profits, or damages resulting from lost data or business interruption) resulting from the use of or inability to use the REACH Rehab + Chiropractic Performance Center Site or the Content, whether based on warranty, contract, tort, or any other legal theory, and whether or not REACH Rehab + Chiropractic Performance Center, its licensors, its suppliers, or any third parties mentioned on the REACH Rehab + Chiropractic Performance Center Site are advised of the possibility of such damages. REACH Rehab + Chiropractic Performance Center, its licensors, its suppliers, or any third parties mentioned on the REACH Rehab + Chiropractic Performance Center Site are not liable for any personal injury, including death, caused by your use or misuse of the Site, or Content. REACH Rehab + Chiropractic Performance Center has tools that allow you to sign up to receive information, record and store information. You are responsible for taking all reasonable steps to ensure that no unauthorized person shall have access to your REACH Rehab + Chiropractic Performance Center passwords or accounts. It is your sole responsibility to (1) control the dissemination and use of activation codes and passwords; (2) authorize, monitor, and control access to and use of your REACH Rehab + Chiropractic Performance Center account and password; (3) promptly inform REACH Rehab + Chiropractic Performance Center of any need to deactivate a password. You grant REACH Rehab + Chiropractic Performance Center and all other persons or entities involved in the operation of the Site the right to transmit, monitor, retrieve, store, and use your information in connection with the operation of the Site. REACH Rehab + Chiropractic Performance Center cannot and does not assume any responsibility or liability for any information you submit, or your or third parties’ use or misuse of information transmitted or received using REACH Rehab + Chiropractic Performance Center tools and services. REACH Rehab + Chiropractic Performance Center may provide links to third-party web sites. REACH Rehab + Chiropractic Performance Center may agree to allow advertisers to respond to certain search terms with advertisements or sponsored content. REACH Rehab + Chiropractic Performance Center does not recommend and does not endorse the content on any third-party websites. 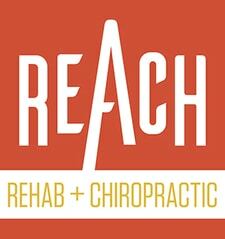 REACH Rehab + Chiropractic Performance Center is not responsible for the content of linked third-party sites, sites framed within the REACH Rehab + Chiropractic Performance Center Site, third-party sites provided as search results, or third-party advertisements, and does not make any representations regarding their content or accuracy. Your use of third-party websites is at your own risk and subject to the terms and conditions of use for such sites. REACH Rehab + Chiropractic Performance Center does not endorse any product, service, or treatment advertised on the REACH Rehab + Chiropractic Performance Center Site. You agree to defend, indemnify, and hold REACH Rehab + Chiropractic Performance Center, its officers, directors, employees, agents, licensors, and suppliers, harmless from and against any claims, actions or demands, liabilities and settlements including without limitation, reasonable legal and accounting fees, resulting from, or alleged to result from, your violation of these Terms and Conditions. REACH Rehab + Chiropractic Performance Center is based in Plymouth, Canton, MI. REACH Rehab + Chiropractic Performance Center makes no claims that REACH Rehab + Chiropractic Performance Center’s, Content are appropriate or may be downloaded in any geographic area. Access to the Content may not be legal by certain persons or in certain countries. If you access the REACH Rehab + Chiropractic Performance Center Network, you do so at your own risk and are responsible for compliance with the laws of your jurisdiction. You expressly agree that exclusive jurisdiction for any dispute with REACH Rehab + Chiropractic Performance Center, or in any way relating to your use of the REACH Rehab + Chiropractic Performance Center Site, resides in the courts of MI, United States and you further agree and expressly consent to the exercise of personal jurisdiction in the courts of MI, United States in connection with any such dispute including any claim involving REACH Rehab + Chiropractic Performance Center or its affiliates, subsidiaries, employees, contractors, officers, directors, telecommunication providers, and content providers.